Definition at line 33 of file CEvaluationNode.h. Definition at line 39 of file CEvaluationNode.h. Definition at line 183 of file CEvaluationNode.cpp. Definition at line 193 of file CEvaluationNode.cpp. Definition at line 204 of file CEvaluationNode.cpp. Definition at line 214 of file CEvaluationNode.cpp. Definition at line 364 of file CEvaluationNode.cpp. Build the Berkeley Madonna string. Definition at line 307 of file CEvaluationNode.cpp. References CNodeContextIterator< Node, Context >::context(), CNodeContextIterator< Node, Context >::end(), getBerkeleyMadonnaString(), CNodeContextIterator< Node, Context >::next(), and CNodeContextIterator< Node, Context >::parentContextPtr(). Referenced by CExpression::getBerkeleyMadonnaString(), CODEExporterBM::getDisplayExpressionString(), and CODEExporterBM::getDisplayFunctionString(). Definition at line 280 of file CEvaluationNode.cpp. References CNodeContextIterator< Node, Context >::context(), CNodeContextIterator< Node, Context >::end(), getCCodeString(), CNodeContextIterator< Node, Context >::next(), and CNodeContextIterator< Node, Context >::parentContextPtr(). Referenced by CODEExporterC::exportSingleFunction(), CExpression::getCCodeString(), and CODEExporterC::getDisplayExpressionString(). Build the human readable display string. Definition at line 250 of file CEvaluationNode.cpp. References CNodeContextIterator< Node, Context >::context(), CNodeContextIterator< Node, Context >::end(), getDisplayString(), CNodeContextIterator< Node, Context >::next(), and CNodeContextIterator< Node, Context >::parentContextPtr(). Definition at line 223 of file CEvaluationNode.cpp. References CNodeContextIterator< Node, Context >::context(), CNodeContextIterator< Node, Context >::end(), getInfix(), CNodeContextIterator< Node, Context >::next(), and CNodeContextIterator< Node, Context >::parentContextPtr(). Referenced by CExpression::compile(), CMathExpression::convertToInitialExpression(), createItem(), CKinFunction::createParameters(), CNormalTranslation::eliminate(), CNormalTranslation::matchPowerBases(), CNormalTranslation::matchSummands(), CNormalTranslation::normAndSimplifyReptdly(), operator<<(), CMathContainer::replaceDiscontinuousNode(), CNormalTranslation::simplify(), CEvaluationNodeOperator::simplifyNode(), CNormalTranslation::simplifyTreeReptdly(), CExpression::updateInfix(), and CEvaluationTree::updateTree(). Definition at line 452 of file CEvaluationNode.cpp. References CNodeContextIterator< Node, Context >::context(), CNodeContextIterator< Node, Context >::end(), getMMLString(), CNodeContextIterator< Node, Context >::next(), and CNodeContextIterator< Node, Context >::parentContextPtr(). Referenced by CExpression::writeMathML(), and CFunction::writeMathML(). Definition at line 334 of file CEvaluationNode.cpp. References CNodeContextIterator< Node, Context >::context(), CNodeContextIterator< Node, Context >::end(), getXPPString(), CNodeContextIterator< Node, Context >::next(), and CNodeContextIterator< Node, Context >::parentContextPtr(). Referenced by CODEExporterXPPAUT::getDisplayExpressionString(), CODEExporterXPPAUT::getDisplayFunctionString(), and CExpression::getXPPString(). Reimplemented in CEvaluationNodeFunction, CEvaluationNodeLogical, CEvaluationNodeVariable, CEvaluationNodeOperator, CEvaluationNodeChoice, and CEvaluationNodeCall. Definition at line 150 of file CEvaluationNode.h. Reimplemented in CEvaluationNodeFunction, CEvaluationNodeLogical, CEvaluationNodeDelay, CEvaluationNodeOperator, CEvaluationNodeObject, CEvaluationNodeChoice, CEvaluationNodeCall, and CEvaluationNodeVariable. Definition at line 216 of file CEvaluationNode.cpp. Referenced by CEvaluationTree::compileNodes(), CDerive::compileTree(), convertToCEvaluationNode(), and CEvaluationNodeDelay::fromAST(). Copy the whole branch with this node as root. Definition at line 404 of file CEvaluationNode.cpp. References CNodeContextIterator< Node, Context >::context(), copyNode(), CNodeContextIterator< Node, Context >::end(), CNodeContextIterator< Node, Context >::next(), and CNodeContextIterator< Node, Context >::parentContextPtr(). Referenced by CODEExporter::assembleSubTreeForMassAction(), CMathTrigger::compileNE(), convertToCEvaluationNode(), CMathExpression::copy(), CMathTrigger::copyBranch(), CNormalTranslation::createChain(), CFunction::createCopy(), SBMLImporter::createCReactionFromReaction(), createLogical(), createNormalRepresentation(), CNormalTranslation::createOperatorChain(), createProduct(), CDerive::deriveBranch(), SBMLImporter::divideByObject(), CNormalTranslation::elementaryEliminationDivide(), CNormalTranslation::elementaryEliminationFunction(), CNormalTranslation::elementaryEliminationMinus(), CNormalTranslation::elementaryEliminationMultiply(), CNormalTranslation::elementaryEliminationPlus(), CNormalTranslation::elementaryEliminationPower(), CNormalTranslation::eliminate(), CNormalTranslation::eliminateDirectlyNestedFractions(), CNormalTranslation::eliminateNestedPowers(), CNormalTranslation::eliminatePowersOfFractions(), expand_function_call(), CNormalTranslation::expandPowerBases(), CNormalTranslation::expandPowerNodes(), CODEExporter::exportSingleFunction(), CEvaluationNodeNormalizer::findChainNodes(), CNormalTranslation::findNegativeNumbers(), SBMLImporter::isMassActionExpression(), CNormalTranslation::matchPowerBases(), CNormalTranslation::matchSummands(), CSBMLExporter::multiplyByObject(), CNormalTranslation::newCancel(), CNormalTranslation::newEvaluateNumbers(), CEvaluationNodeNormalizer::normalize(), CEvaluationNodeNormalizer::normalizeCEvaluationNodeCall(), CEvaluationNodeNormalizer::normalizeCEvaluationNodeChoice(), CEvaluationNodeNormalizer::normalizeCEvaluationNodeConstant(), CEvaluationNodeNormalizer::normalizeCEvaluationNodeDelay(), CEvaluationNodeNormalizer::normalizeCEvaluationNodeFunction(), CEvaluationNodeNormalizer::normalizeCEvaluationNodeLogical(), CEvaluationNodeNormalizer::normalizeCEvaluationNodeNumber(), CEvaluationNodeNormalizer::normalizeCEvaluationNodeObject(), CEvaluationNodeNormalizer::normalizeCEvaluationNodeOperator(), CEvaluationNodeNormalizer::normalizeCEvaluationNodeStructure(), CEvaluationNodeNormalizer::normalizeCEvaluationNodeVariable(), CEvaluationNodeNormalizer::normalizeCEvaluationNodeVector(), CEvaluationNodeNormalizer::normalizeCEvaluationNodeWhiteSpace(), CEvaluationNodeNormalizer::normalizeDivideNode(), CEvaluationNodeNormalizer::normalizeMinusNode(), CEvaluationNodeNormalizer::normalizeModulusNode(), CEvaluationNodeNormalizer::normalizeMultiplyNode(), CEvaluationNodeNormalizer::normalizePlusNode(), CEvaluationNodeNormalizer::normalizePowerNode(), CNormalTranslation::product2fraction(), CSBMLExporter::replaceSpeciesReferences(), CReaction::setFunctionFromExpressionTree(), CNormalTranslation::simplify(), CEvaluationNodeOperator::simplifyNode(), CEvaluationNodeFunction::simplifyNode(), splitBranch(), and CNormalTranslation::splitSum(). Definition at line 378 of file CEvaluationNode.cpp. Referenced by CMathEventN::CTrigger::compile(), CMathContainer::copyBranch(), copyBranch(), CNormalTranslation::eliminateDirectlyNestedFractions(), CNormalTranslation::eliminateNestedPowers(), CNormalTranslation::eliminatePowersOfFractions(), expand_function_calls(), CNormalTranslation::expandPowerBases(), CNormalTranslation::expandPowerNodes(), CNormalTranslation::expandProducts(), CNormalTranslation::findNegativeNumbers(), CReaction::objects2variables(), CNormalTranslation::product2fraction(), replace_variable_names(), CMathContainer::replaceDiscontinuousNode(), CSBMLExporter::replaceSpeciesReferences(), CEvaluationNodeOperator::simplifyNode(), CEvaluationNodeFunction::simplifyNode(), simplifyNode(), and splitBranch(). Definition at line 389 of file CEvaluationNode.cpp. References CCopasiNode< _Data >::addChild(), create(), CCopasiNode< std::string >::getData(), and mType. Definition at line 37 of file CEvaluationNode.cpp. References CALL, CEvaluationNode(), CHOICE, CONSTANT, DELAY, FUNCTION, INVALID, LOGICAL, MV_FUNCTION, NUMBER, OBJECT, OPERATOR, STRUCTURE, subType(), type(), VARIABLE, VECTOR, and WHITESPACE. 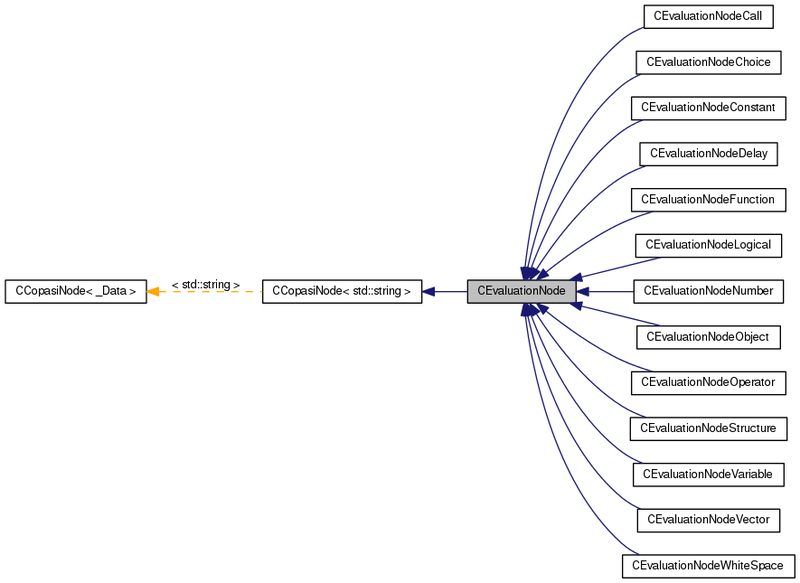 Referenced by CODEExporter::assembleSubTreeForMassAction(), CEvaluationNodeNormalizer::collectIdenticalBranches(), copyNode(), CNormalTranslation::expandPowerExponents(), CODEExporter::modifyTreeForMassAction(), CEvaluationNodeNormalizer::normalizeCEvaluationNodeCall(), CEvaluationNodeOperator::simplifyNode(), CEvaluationNodeFunction::simplifyNode(), and SBMLImporter::variables2objects(). Find a minus operator in the tree that is suitable for splitting with splitBranch(). Specifically it is a minus operator that is connected with the root node by multiplication or division nodes only. For the division nodes only the left child is considered. Definition at line 566 of file CEvaluationNode.cpp. References CNodeIteratorMode::After, CNodeIteratorMode::Before, CNodeContextIterator< Node, Context >::context(), CEvaluationNodeOperator::DIVIDE, CNodeContextIterator< Node, Context >::end(), CFunctionAnalyzer::evaluateNode(), CCopasiNode< _Data >::getChild(), CCopasiNode< _Data >::getData(), getType(), CFunctionAnalyzer::CValue::isPositive(), CEvaluationNodeOperator::MINUS, CEvaluationNodeOperator::MULTIPLY, CNodeContextIterator< Node, Context >::next(), CFunctionAnalyzer::NOOBJECT, OPERATOR, CNodeContextIterator< Node, Context >::parentContextPtr(), CNodeContextIterator< Node, Context >::processingMode(), CNodeContextIterator< Node, Context >::setProcessingModes(), and CNodeContextIterator< Node, Context >::skipChildren(). 589 // We found a minus no need to go down the tree. 608 // Both children contain a minus, this is not a valid split point. Reimplemented in CEvaluationNodeFunction, CEvaluationNodeLogical, CEvaluationNodeOperator, CEvaluationNodeCall, CEvaluationNodeObject, CEvaluationNodeChoice, CEvaluationNodeConstant, CEvaluationNodeVector, and CEvaluationNodeDelay. Definition at line 304 of file CEvaluationNode.cpp. Reimplemented in CEvaluationNodeFunction, CEvaluationNodeLogical, CEvaluationNodeOperator, CEvaluationNodeCall, CEvaluationNodeObject, CEvaluationNodeChoice, CEvaluationNodeNumber, CEvaluationNodeConstant, CEvaluationNodeVector, and CEvaluationNodeDelay. Definition at line 274 of file CEvaluationNode.cpp. Reimplemented in CEvaluationNodeFunction, CEvaluationNodeLogical, CEvaluationNodeOperator, CEvaluationNodeCall, CEvaluationNodeObject, CEvaluationNodeChoice, CEvaluationNodeVector, and CEvaluationNodeDelay. Definition at line 247 of file CEvaluationNode.cpp. Reimplemented in CEvaluationNodeFunction, CEvaluationNodeLogical, CEvaluationNodeDelay, CEvaluationNodeOperator, CEvaluationNodeObject, CEvaluationNodeCall, CEvaluationNodeChoice, and CEvaluationNodeVector. Definition at line 220 of file CEvaluationNode.cpp. Reimplemented in CEvaluationNodeFunction, CEvaluationNodeLogical, CEvaluationNodeOperator, CEvaluationNodeCall, CEvaluationNodeObject, CEvaluationNodeChoice, CEvaluationNodeConstant, CEvaluationNodeDelay, CEvaluationNodeVariable, and CEvaluationNodeNumber. Definition at line 445 of file CEvaluationNode.cpp. Retrieve the type of the node. Note the type combines type and subType information. To Retrieve the type use type(getType()) and to retrieve the subType use subType(getType()). Definition at line 357 of file CEvaluationNode.cpp. Referenced by SBMLImporter::areEqualSubtrees(), CODEExporter::assembleSubTreeForMassAction(), CEvaluationTree::buildCalculationSequence(), CSBMLExporter::checkForPiecewiseFunctions(), CSBMLExporter::checkForUnsupportedFunctionCalls(), CEvaluationNodeNormalizer::collectIdenticalBranches(), CMathEventN::CTrigger::compile(), CMathTrigger::compile(), CMathEventN::CTrigger::compileAND(), CMathTrigger::compileEQ(), CMathEventN::CTrigger::compileLE(), CMathTrigger::copyBranch(), CMathContainer::copyBranch(), CMathEventN::CTrigger::countRoots(), createCall(), createChoice(), SBMLImporter::createCReactionFromReaction(), CMathContainer::createDiscontinuityTriggerInfix(), CSBMLExporter::createEvent(), createFunction(), createGeneralPower(), CSBMLExporter::createInitialAssignment(), createItem(), createItemPower(), createItemPowerItem(), createLogical(), createLogicalChoice(), createLogicalItem(), CEvaluationNodeOperator::createModuloTree(), createNormalRepresentation(), createProduct(), CSBMLExporter::createRule(), createSum(), CDerive::deriveBranch(), SBMLImporter::divideByObject(), CNormalTranslation::elementaryElimination(), CNormalTranslation::elementaryEliminationDivide(), CNormalTranslation::elementaryEliminationFunction(), CNormalTranslation::elementaryEliminationMinus(), CNormalTranslation::elementaryEliminationModulus(), CNormalTranslation::elementaryEliminationMultiply(), CNormalTranslation::elementaryEliminationPlus(), CNormalTranslation::elementaryEliminationPower(), CNormalTranslation::eliminateDirectlyNestedFractions(), CNormalTranslation::eliminateNestedPowers(), CNormalTranslation::eliminatePowersOfFractions(), CFunctionAnalyzer::evaluateNode(), CNormalTranslation::expandPowerBases(), CNormalTranslation::expandPowerExponents(), CNormalTranslation::expandPowerNodes(), CNormalTranslation::expandProducts(), CSBMLExporter::exportEventAssignments(), CNormalTranslation::factorize(), CEvaluationNodeNormalizer::findChainNodes(), CFindDimensions::findDimension(), CSBMLExporter::findDirectlyUsedFunctions(), CSBMLExporter::findModelEntityDependencies(), CNormalTranslation::findNegativeNumbers(), CNormalTranslation::findSummands(), findTopMinus(), CEvaluationNodeConstant::getBerkeleyMadonnaString(), CEvaluationNodeLogical::getBerkeleyMadonnaString(), CEvaluationNodeFunction::getBerkeleyMadonnaString(), CEvaluationNodeConstant::getCCodeString(), CEvaluationNodeOperator::getCCodeString(), CEvaluationNodeLogical::getCCodeString(), CEvaluationNodeFunction::getCCodeString(), CEvaluationNodeConstant::getMMLString(), CEvaluationNodeOperator::getMMLString(), CEvaluationNodeLogical::getMMLString(), CEvaluationNodeFunction::getMMLString(), CEvaluationNodeConstant::getXPPString(), CEvaluationNodeOperator::getXPPString(), CEvaluationNodeLogical::getXPPString(), CEvaluationNodeFunction::getXPPString(), CEvaluationNodeFunction::handleNot(), CEvaluationNodeFunction::handleSign(), SBMLImporter::isConstantFlux(), CSBMLExporter::isEventAssignmentSBMLCompatible(), isLogical(), SBMLImporter::isMassAction(), SBMLImporter::isMassActionExpression(), CMathObject::isPrerequisiteForContext(), CNormalTranslation::matchPowerBases(), CNormalTranslation::matchSummands(), CSBMLExporter::multiplyByObject(), CNormalTranslation::newCancel(), CNormalTranslation::newEvaluateNumbers(), CEvaluationNodeNormalizer::normalize(), CEvaluationNodeNormalizer::normalizeCEvaluationNodeCall(), CEvaluationNodeNormalizer::normalizeCEvaluationNodeChoice(), CEvaluationNodeNormalizer::normalizeCEvaluationNodeDelay(), CEvaluationNodeNormalizer::normalizeCEvaluationNodeFunction(), CEvaluationNodeNormalizer::normalizeCEvaluationNodeLogical(), CEvaluationNodeNormalizer::normalizeCEvaluationNodeOperator(), CEvaluationNodeNormalizer::normalizeCEvaluationNodeVector(), CEvaluationNodeNormalizer::normalizeDivideNode(), CEvaluationNodeNormalizer::normalizeMinusNode(), CEvaluationNodeNormalizer::normalizeModulusNode(), CEvaluationNodeNormalizer::normalizeMultiplyNode(), CEvaluationNodeNormalizer::normalizePlusNode(), CEvaluationNodeNormalizer::normalizePowerNode(), CReaction::objects2variables(), operator<(), operator==(), CNormalTranslation::product2fraction(), CSBMLExporter::replaceSpeciesReferences(), SBMLImporter::separateProductArguments(), setBooleanRequired(), CSBMLExporter::setFunctionSBMLIds(), CEvaluationNodeOperator::simplifyNode(), CNormalTranslation::splitProduct(), CNormalTranslation::splitSum(), CNormalTranslation::swapNegativeNumbers(), test000053::test1_bug1000(), test000053::test2_bug1000(), test000053::test3_bug1000(), test000053::test4_bug1000(), test000053::test5_bug1000(), test000093::test_bug1503_1(), test000093::test_bug1503_2(), test000052::test_bug988(), test_compare_utilities::test_copasi_function_expansion(), test000091::test_delay_in_kinetic_law(), test000091::test_delay_in_kinetic_law_local_parameter(), test_depth_first_iterator::test_dfi(), test000042::test_hasOnlySubstanceUnits(), test000026::test_hasOnlySubstanceUnits(), test000040::test_hasOnlySubstanceUnits(), test000023::test_hasOnlySubstanceUnits(), test000043::test_hasOnlySubstanceUnits(), test000025::test_hasOnlySubstanceUnits(), test000033::test_hasOnlySubstanceUnits(), test000082::test_import_delayAssignment_1(), test000082::test_import_delayAssignment_2(), test000082::test_import_delayAssignment_3(), test000082::test_import_delayAssignment_4(), test000082::test_import_delayAssignment_5(), test000082::test_import_delayAssignment_6(), test000082::test_import_delayAssignment_7(), test000082::test_import_delayAssignment_8(), test000064::test_import_event_assignment_expression_and_hasOnlySubstanceUnits_1(), test000064::test_import_event_assignment_expression_and_hasOnlySubstanceUnits_2(), test000064::test_import_event_assignment_expression_and_hasOnlySubstanceUnits_3(), test000064::test_import_event_assignment_expression_and_hasOnlySubstanceUnits_4(), test000064::test_import_event_assignment_expression_and_hasOnlySubstanceUnits_5(), test000064::test_import_event_assignment_expression_and_hasOnlySubstanceUnits_6(), test000064::test_import_event_assignment_expression_and_hasOnlySubstanceUnits_7(), test000064::test_import_event_assignment_expression_and_hasOnlySubstanceUnits_8(), test000095::test_import_l3_event_1(), test000095::test_import_l3_event_2(), test000095::test_import_l3_event_3(), test000095::test_import_l3_event_4(), test000095::test_import_l3_event_5(), test000087::test_import_reaction_flux_reference_2(), test000065::test_import_reaction_with_unsuitable_kinetic_1(), test000065::test_import_reaction_with_unsuitable_kinetic_2(), test000064::test_import_rule_expression_and_hasOnlySubstanceUnits_1(), test000064::test_import_rule_expression_and_hasOnlySubstanceUnits_2(), test000064::test_import_rule_expression_and_hasOnlySubstanceUnits_3(), test000064::test_import_rule_expression_and_hasOnlySubstanceUnits_4(), test000064::test_import_rule_expression_and_hasOnlySubstanceUnits_5(), test000064::test_import_rule_expression_and_hasOnlySubstanceUnits_6(), test000064::test_import_rule_expression_and_hasOnlySubstanceUnits_7(), test000064::test_import_rule_expression_and_hasOnlySubstanceUnits_8(), test000075::test_import_time_dependent_function_definition(), test000078::test_l2v4_import_unordered_functions(), test000087::test_simulate_reaction_flux_reference_1(), CEvaluationNodeNumber::toAST(), CEvaluationNodeConstant::toAST(), CEvaluationNodeOperator::toAST(), CEvaluationNodeLogical::toAST(), CEvaluationNodeFunction::toAST(), SBMLImporter::variables2objects(), CReaction::variables2objects(), and CEvaluationNodeCall::verifyParameters(). Definition at line 144 of file CEvaluationNode.h. Referenced by CEvaluationNodeChoice::calculate(), CEvaluationNodeOperator::calculate(), CEvaluationNodeLogical::calculate(), CEvaluationNodeFunction::calculate(), CEvaluationTree::calculate(), createProduct(), CNormalTranslation::elementaryEliminationModulus(), CNormalTranslation::elementaryEliminationPower(), CEvaluationNodeNormalizer::eliminateMultipleNumbers(), CFunctionAnalyzer::evaluateNode(), CFindDimensions::findDimension(), CNormalTranslation::findNegativeNumbers(), CEvaluationNodeNumber::getCCodeString(), SBMLImporter::isMassActionExpression(), CNormalTranslation::matchPowerBases(), CNormalTranslation::matchSummands(), CNormalTranslation::newEvaluateNumbers(), CEvaluationNodeNormalizer::normalizeDivideNode(), CEvaluationNodeNormalizer::normalizeMinusNode(), CEvaluationNodeNormalizer::normalizeModulusNode(), CEvaluationNodeNormalizer::normalizeMultiplyNode(), CEvaluationNodeNormalizer::normalizePlusNode(), CEvaluationNodeNormalizer::normalizePowerNode(), CEvaluationNodeOperator::simplifyNode(), CNormalTranslation::splitSum(), CNormalTranslation::swapNegativeNumbers(), test000093::test_bug1503_1(), test000093::test_bug1503_2(), test_depth_first_iterator::test_dfi(), test000082::test_import_delayAssignment_1(), test000082::test_import_delayAssignment_2(), test000082::test_import_delayAssignment_3(), test000082::test_import_delayAssignment_4(), test000082::test_import_delayAssignment_5(), test000082::test_import_delayAssignment_6(), test000082::test_import_delayAssignment_7(), test000082::test_import_delayAssignment_8(), test000064::test_import_event_assignment_expression_and_hasOnlySubstanceUnits_1(), test000064::test_import_event_assignment_expression_and_hasOnlySubstanceUnits_2(), test000064::test_import_event_assignment_expression_and_hasOnlySubstanceUnits_3(), test000064::test_import_event_assignment_expression_and_hasOnlySubstanceUnits_4(), test000064::test_import_event_assignment_expression_and_hasOnlySubstanceUnits_5(), test000064::test_import_event_assignment_expression_and_hasOnlySubstanceUnits_6(), test000064::test_import_event_assignment_expression_and_hasOnlySubstanceUnits_7(), test000064::test_import_event_assignment_expression_and_hasOnlySubstanceUnits_8(), test000095::test_import_l3_event_1(), test000095::test_import_l3_event_2(), test000095::test_import_l3_event_3(), test000095::test_import_l3_event_4(), test000095::test_import_l3_event_5(), test000078::test_l2v4_import_unordered_functions(), and CEvaluationNodeNumber::toAST(). Definition at line 441 of file CEvaluationNode.cpp. Definition at line 331 of file CEvaluationNode.cpp. Reimplemented in CEvaluationNodeCall, CEvaluationNodeFunction, CEvaluationNodeLogical, and CEvaluationNodeConstant. Definition at line 361 of file CEvaluationNode.cpp. Referenced by CMathEventN::CTrigger::compile(), CMathTrigger::compile(), CMathTrigger::compileEXPRESSION(), CMathTrigger::compileFUNCTION(), CMathTrigger::compileVARIABLE(), CMathEventN::CTrigger::countRoots(), CEvaluationTree::isBoolean(), and CExpression::setInfix(). Definition at line 173 of file CEvaluationNode.cpp. Referenced by CEvaluationNodeCall::CEvaluationNodeCall(), CEvaluationNodeCall::getData(), and CEvaluationNodeCall::setData(). Unequal operator, compares two CEvaluationNode objects and return true if they are equal. Definition at line 666 of file CEvaluationNode.cpp. Less operator, compares two CEvaluationNode objects and return true if the first operand is smaller than the second. Definition at line 699 of file CEvaluationNode.cpp. References CALL, CHOICE, CONSTANT, DELAY, FUNCTION, CCopasiNode< std::string >::getChild(), CCopasiNode< _Data >::getChild(), CCopasiNode< std::string >::getData(), CCopasiNode< _Data >::getData(), CCopasiNode< _Data >::getSibling(), getType(), INVALID, LOGICAL, MV_FUNCTION, NUMBER, OBJECT, OPERATOR, STRUCTURE, type(), VARIABLE, VECTOR, and WHITESPACE. Comparison operator used to evaluate the precedence of the node. it compares the right precedence of the left node with the left precedence of the right node. Definition at line 375 of file CEvaluationNode.cpp. 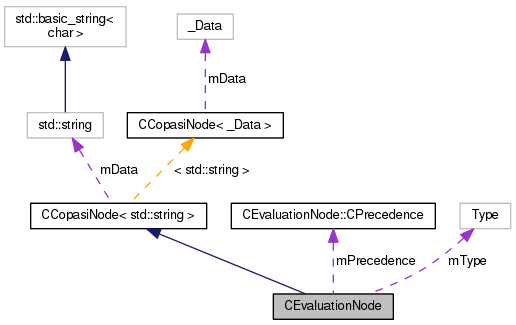 References CEvaluationNode::CPrecedence::left, mPrecedence, and CEvaluationNode::CPrecedence::right. Equals operator, compares two CEvaluationNode objects and return true if they are equal. Definition at line 671 of file CEvaluationNode.cpp. References CNodeContextIterator< Node, int >::end(), CCopasiNode< _Data >::getData(), getType(), and CNodeContextIterator< Node, int >::next(). Definition at line 477 of file CEvaluationNode.cpp. References CCopasiNode< std::string >::getChild(), CCopasiNode< _Data >::getSibling(), CCopasiNode< std::string >::mData, mType, mValue, printRecursively(), subType(), and type(). Definition at line 506 of file CEvaluationNode.cpp. Reimplemented in CEvaluationNodeFunction, and CEvaluationNodeOperator. Definition at line 430 of file CEvaluationNode.cpp. Referenced by CEvaluationNodeOperator::simplifyNode(), and CNormalTranslation::simplifyTree(). Split the tree in two parts at the given splitnode, starting from *this. Returned is the root node of a copy of the tree, including everything above the split node and either the branch below the left child of the split node or the branch below the right child of the split node. The split node itself is not included either case. Definition at line 511 of file CEvaluationNode.cpp. References copyBranch(), copyNode(), CCopasiNode< std::string >::getChild(), CCopasiNode< _Data >::getSibling(), and splitBranch(). Referenced by splitBranch(), and CFunction::splitFunction(). Definition at line 120 of file CEvaluationNode.cpp. Referenced by CSBMLExporter::checkForUnsupportedFunctionCalls(), CEvaluationNodeObject::compile(), CMathTrigger::compile(), CMathEventN::CTrigger::compileAND(), CMathEventN::CTrigger::compileLE(), CMathEventN::CTrigger::countRoots(), create(), createCall(), createFunction(), createGeneralPower(), createItemPower(), createItemPowerItem(), createLogical(), createLogicalItem(), CEvaluationNodeOperator::createModuloTree(), createProduct(), createSum(), CDerive::deriveBranch(), SBMLImporter::divideByObject(), CNormalTranslation::elementaryElimination(), CNormalTranslation::elementaryEliminationDivide(), CNormalTranslation::elementaryEliminationFunction(), CNormalTranslation::elementaryEliminationMinus(), CNormalTranslation::elementaryEliminationModulus(), CNormalTranslation::elementaryEliminationMultiply(), CNormalTranslation::elementaryEliminationPlus(), CNormalTranslation::elementaryEliminationPower(), CNormalTranslation::eliminateDirectlyNestedFractions(), CNormalTranslation::eliminateNestedPowers(), CNormalTranslation::eliminatePowersOfFractions(), CFunctionAnalyzer::evaluateNode(), CNormalTranslation::expandPowerBases(), CNormalTranslation::expandPowerExponents(), CNormalTranslation::expandPowerNodes(), CNormalTranslation::expandProducts(), CNormalTranslation::factorize(), CEvaluationNodeNormalizer::findChainNodes(), CNormalTranslation::findNegativeNumbers(), CNormalTranslation::findSummands(), CEvaluationNodeNumber::fromAST(), CEvaluationNodeDelay::fromAST(), CEvaluationNodeConstant::fromAST(), CEvaluationNodeChoice::fromAST(), CEvaluationNodeCall::fromAST(), CEvaluationNodeOperator::fromAST(), CEvaluationNodeLogical::fromAST(), CEvaluationNodeFunction::fromAST(), CEvaluationNodeConstant::getBerkeleyMadonnaString(), CEvaluationNodeLogical::getBerkeleyMadonnaString(), CEvaluationNodeFunction::getBerkeleyMadonnaString(), CEvaluationNodeConstant::getCCodeString(), CEvaluationNodeOperator::getCCodeString(), CEvaluationNodeLogical::getCCodeString(), CEvaluationNodeFunction::getCCodeString(), CEvaluationNodeObject::getData(), CEvaluationNodeObject::getInfix(), CEvaluationNodeConstant::getMMLString(), CEvaluationNodeLogical::getMMLString(), CEvaluationNodeConstant::getXPPString(), CEvaluationNodeOperator::getXPPString(), CEvaluationNodeLogical::getXPPString(), CEvaluationNodeFunction::getXPPString(), CEvaluationNodeConstant::isBoolean(), CEvaluationNodeFunction::isBoolean(), isLogical(), SBMLImporter::isMassActionExpression(), CNormalTranslation::matchPowerBases(), CNormalTranslation::matchSummands(), CSBMLExporter::multiplyByObject(), CNormalTranslation::newCancel(), CNormalTranslation::newEvaluateNumbers(), CEvaluationNodeNormalizer::normalizeCEvaluationNodeCall(), CEvaluationNodeNormalizer::normalizeCEvaluationNodeDelay(), CEvaluationNodeNormalizer::normalizeCEvaluationNodeFunction(), CEvaluationNodeNormalizer::normalizeCEvaluationNodeLogical(), CEvaluationNodeNormalizer::normalizeCEvaluationNodeOperator(), CEvaluationNodeNormalizer::normalizeCEvaluationNodeVector(), CEvaluationNodeNormalizer::normalizeModulusNode(), CEvaluationNodeNormalizer::normalizeMultiplyNode(), CEvaluationNodeNormalizer::normalizePlusNode(), printRecursively(), CNormalTranslation::product2fraction(), CSBMLExporter::replaceSpeciesReferences(), SBMLImporter::separateProductArguments(), CEvaluationNodeObject::setData(), CFunction::setInfix(), CEvaluationNodeObject::setObjectValuePtr(), CEvaluationNodeOperator::simplifyNode(), CEvaluationNodeFunction::simplifyNode(), CNormalTranslation::splitProduct(), CNormalTranslation::splitSum(), CNormalTranslation::swapNegativeNumbers(), test000053::test1_bug1000(), test000053::test2_bug1000(), test000053::test3_bug1000(), test000053::test4_bug1000(), test000053::test5_bug1000(), test000093::test_bug1503_1(), test000093::test_bug1503_2(), test000052::test_bug988(), test_compare_utilities::test_copasi_function_expansion(), test000047::test_delay(), test000091::test_delay_in_kinetic_law(), test000091::test_delay_in_kinetic_law_local_parameter(), test_depth_first_iterator::test_dfi(), test000023::test_hasOnlySubstanceUnits(), test000025::test_hasOnlySubstanceUnits(), test000033::test_hasOnlySubstanceUnits(), test000042::test_hasOnlySubstanceUnits(), test000040::test_hasOnlySubstanceUnits(), test000043::test_hasOnlySubstanceUnits(), test000026::test_hasOnlySubstanceUnits(), test000082::test_import_delayAssignment_1(), test000082::test_import_delayAssignment_2(), test000082::test_import_delayAssignment_3(), test000082::test_import_delayAssignment_4(), test000082::test_import_delayAssignment_5(), test000082::test_import_delayAssignment_6(), test000082::test_import_delayAssignment_7(), test000082::test_import_delayAssignment_8(), test000064::test_import_event_assignment_expression_and_hasOnlySubstanceUnits_1(), test000064::test_import_event_assignment_expression_and_hasOnlySubstanceUnits_2(), test000064::test_import_event_assignment_expression_and_hasOnlySubstanceUnits_3(), test000064::test_import_event_assignment_expression_and_hasOnlySubstanceUnits_4(), test000064::test_import_event_assignment_expression_and_hasOnlySubstanceUnits_5(), test000064::test_import_event_assignment_expression_and_hasOnlySubstanceUnits_6(), test000064::test_import_event_assignment_expression_and_hasOnlySubstanceUnits_7(), test000064::test_import_event_assignment_expression_and_hasOnlySubstanceUnits_8(), test000095::test_import_l3_event_1(), test000095::test_import_l3_event_2(), test000095::test_import_l3_event_3(), test000095::test_import_l3_event_4(), test000095::test_import_l3_event_5(), test000065::test_import_reaction_with_unsuitable_kinetic_1(), test000065::test_import_reaction_with_unsuitable_kinetic_2(), test000064::test_import_rule_expression_and_hasOnlySubstanceUnits_1(), test000064::test_import_rule_expression_and_hasOnlySubstanceUnits_4(), test000064::test_import_rule_expression_and_hasOnlySubstanceUnits_6(), test000064::test_import_rule_expression_and_hasOnlySubstanceUnits_7(), test000075::test_import_time_dependent_function_definition(), test000078::test_l2v4_import_unordered_functions(), CEvaluationNodeNumber::toAST(), CEvaluationNodeConstant::toAST(), CEvaluationNodeOperator::toAST(), CEvaluationNodeLogical::toAST(), CEvaluationNodeFunction::toAST(), and CReaction::variables2objects(). Create a new invalid ASTNode. Reimplemented in CEvaluationNodeFunction, CEvaluationNodeLogical, CEvaluationNodeOperator, CEvaluationNodeCall, CEvaluationNodeObject, CEvaluationNodeChoice, CEvaluationNodeConstant, CEvaluationNodeVector, CEvaluationNodeDelay, CEvaluationNodeVariable, CEvaluationNodeNumber, CEvaluationNodeStructure, and CEvaluationNodeWhiteSpace. Definition at line 436 of file CEvaluationNode.cpp. Referenced by CSBMLExporter::convertToASTNode(), CEvaluationNodeOperator::createModuloTree(), CEvaluationNodeDelay::toAST(), CEvaluationNodeChoice::toAST(), CEvaluationTree::toAST(), CEvaluationNodeObject::toAST(), CEvaluationNodeCall::toAST(), CEvaluationNodeOperator::toAST(), CEvaluationNodeLogical::toAST(), and CEvaluationNodeFunction::toAST(). Definition at line 123 of file CEvaluationNode.cpp. Referenced by CODEExporter::assembleSubTreeForMassAction(), CEvaluationTree::buildCalculationSequence(), CEvaluationNodeCall::buildParameters(), CSBMLExporter::checkForPiecewiseFunctions(), CSBMLExporter::checkForUnsupportedFunctionCalls(), CSBMLExporter::checkForUnsupportedObjectReferences(), CEvaluationNodeCall::clearParameters(), CMathEventN::CTrigger::compile(), CMathTrigger::compile(), CMathTrigger::compileEQ(), CModelAdd::copyDelayExpression(), CModelAdd::copyEventAssignmentExpression(), CModelAdd::copyExpression(), CModelAdd::copyInitialExpression(), CModelAdd::copyTriggerExpression(), CMathEventN::CTrigger::countRoots(), create(), createCall(), createChoice(), SBMLImporter::createCReactionFromReaction(), CSBMLExporter::createEvent(), createFunction(), createGeneralPower(), CSBMLExporter::createInitialAssignment(), createItem(), createItemPower(), createItemPowerItem(), createLogical(), createLogicalChoice(), createLogicalItem(), createNormalRepresentation(), createProduct(), CSBMLExporter::createRule(), createSum(), SBMLImporter::divideByObject(), CNormalTranslation::elementaryElimination(), CNormalTranslation::elementaryEliminationDivide(), CNormalTranslation::elementaryEliminationFunction(), CNormalTranslation::elementaryEliminationMinus(), CNormalTranslation::elementaryEliminationModulus(), CNormalTranslation::elementaryEliminationMultiply(), CNormalTranslation::elementaryEliminationPlus(), CNormalTranslation::elementaryEliminationPower(), CNormalTranslation::eliminateDirectlyNestedFractions(), CNormalTranslation::eliminateNestedPowers(), CNormalTranslation::eliminatePowersOfFractions(), CFunctionAnalyzer::evaluateNode(), CNormalTranslation::expandPowerBases(), CNormalTranslation::expandPowerExponents(), CNormalTranslation::expandPowerNodes(), CNormalTranslation::expandProducts(), CSBMLExporter::exportEventAssignments(), CODEExporter::exportExpression(), CODEExporter::exportKineticFunction(), CODEExporterC::exportSingleFunction(), CODEExporter::exportSingleFunction(), CNormalTranslation::factorize(), CEvaluationNodeNormalizer::findChainNodes(), CSBMLExporter::findDirectlyUsedFunctions(), SBMLImporter::findFunctionCalls(), CODEExporter::findFunctionsCalls(), CSBMLExporter::findModelEntityDependencies(), CNormalTranslation::findNegativeNumbers(), CNormalTranslation::findSummands(), CEvaluationNodeOperator::fromAST(), CEvaluationNodeFunction::fromAST(), CEvaluationNodeFunction::getMMLString(), CFunction::initVariables(), SBMLImporter::isConstantFlux(), CSBMLExporter::isEventAssignmentSBMLCompatible(), isLogical(), SBMLImporter::isMassActionExpression(), CODEExporter::isModelEntityExpressionODEExporterCompatible(), CNormalTranslation::matchPowerBases(), CNormalTranslation::matchSummands(), CModelMerging::mergeInExpression(), CODEExporter::modifyTreeForMassAction(), CNormalTranslation::multiply(), CSBMLExporter::multiplyByObject(), CNormalTranslation::newCancel(), CNormalTranslation::newEvaluateNumbers(), CEvaluationNodeNormalizer::normalize(), CEvaluationNodeNormalizer::normalizeCEvaluationNodeChoice(), CEvaluationNodeNormalizer::normalizeDivideNode(), CEvaluationNodeNormalizer::normalizeMinusNode(), CEvaluationNodeNormalizer::normalizeModulusNode(), CEvaluationNodeNormalizer::normalizeMultiplyNode(), CEvaluationNodeNormalizer::normalizePlusNode(), CEvaluationNodeNormalizer::normalizePowerNode(), CReaction::objects2variables(), operator<(), printRecursively(), CNormalTranslation::product2fraction(), CSBMLExporter::replaceSpeciesReferences(), setBooleanRequired(), CODEExporterC::setExportNameOfFunction(), CSBMLExporter::setFunctionSBMLIds(), CFunction::setInfix(), CEvaluationNodeOperator::simplifyNode(), CEvaluationNodeFunction::simplifyNode(), CNormalTranslation::splitProduct(), CNormalTranslation::splitSum(), CNormalTranslation::swapNegativeNumbers(), test000053::test1_bug1000(), test000053::test2_bug1000(), test000053::test3_bug1000(), test000053::test4_bug1000(), test000053::test5_bug1000(), test000093::test_bug1503_1(), test000093::test_bug1503_2(), test000061::test_bug_1044(), test_compare_utilities::test_copasi_function_expansion(), test000091::test_delay_in_kinetic_law(), test000091::test_delay_in_kinetic_law_local_parameter(), test_depth_first_iterator::test_dfi(), test000082::test_import_delayAssignment_1(), test000082::test_import_delayAssignment_2(), test000082::test_import_delayAssignment_3(), test000082::test_import_delayAssignment_4(), test000082::test_import_delayAssignment_5(), test000082::test_import_delayAssignment_6(), test000082::test_import_delayAssignment_7(), test000082::test_import_delayAssignment_8(), test000064::test_import_event_assignment_expression_and_hasOnlySubstanceUnits_1(), test000064::test_import_event_assignment_expression_and_hasOnlySubstanceUnits_2(), test000064::test_import_event_assignment_expression_and_hasOnlySubstanceUnits_3(), test000064::test_import_event_assignment_expression_and_hasOnlySubstanceUnits_4(), test000064::test_import_event_assignment_expression_and_hasOnlySubstanceUnits_5(), test000064::test_import_event_assignment_expression_and_hasOnlySubstanceUnits_6(), test000064::test_import_event_assignment_expression_and_hasOnlySubstanceUnits_7(), test000064::test_import_event_assignment_expression_and_hasOnlySubstanceUnits_8(), test000095::test_import_l3_event_1(), test000095::test_import_l3_event_2(), test000095::test_import_l3_event_3(), test000095::test_import_l3_event_4(), test000095::test_import_l3_event_5(), test000087::test_import_reaction_flux_reference_2(), test000065::test_import_reaction_with_unsuitable_kinetic_1(), test000065::test_import_reaction_with_unsuitable_kinetic_2(), test000064::test_import_rule_expression_and_hasOnlySubstanceUnits_1(), test000064::test_import_rule_expression_and_hasOnlySubstanceUnits_2(), test000064::test_import_rule_expression_and_hasOnlySubstanceUnits_3(), test000064::test_import_rule_expression_and_hasOnlySubstanceUnits_4(), test000064::test_import_rule_expression_and_hasOnlySubstanceUnits_5(), test000064::test_import_rule_expression_and_hasOnlySubstanceUnits_6(), test000064::test_import_rule_expression_and_hasOnlySubstanceUnits_7(), test000064::test_import_rule_expression_and_hasOnlySubstanceUnits_8(), test000075::test_import_time_dependent_function_definition(), test000078::test_l2v4_import_unordered_functions(), test000087::test_simulate_reaction_flux_reference_1(), CReaction::variables2objects(), and CEvaluationNodeCall::verifyParameters(). Definition at line 86 of file CEvaluationNode.h. Referenced by CEvaluationNodeCall::CEvaluationNodeCall(), CEvaluationNodeChoice::CEvaluationNodeChoice(), CEvaluationNodeConstant::CEvaluationNodeConstant(), CEvaluationNodeDelay::CEvaluationNodeDelay(), CEvaluationNodeFunction::CEvaluationNodeFunction(), CEvaluationNodeLogical::CEvaluationNodeLogical(), CEvaluationNodeNumber::CEvaluationNodeNumber(), CEvaluationNodeObject::CEvaluationNodeObject(), CEvaluationNodeOperator::CEvaluationNodeOperator(), CEvaluationNodeStructure::CEvaluationNodeStructure(), CEvaluationNodeVariable::CEvaluationNodeVariable(), CEvaluationNodeVector::CEvaluationNodeVector(), and operator<(). Definition at line 342 of file CEvaluationNode.h. Referenced by CEvaluationNode(), CEvaluationNodeObject::CEvaluationNodeObject(), CEvaluationNodeObject::compile(), CEvaluationNodeObject::getObjectValuePtr(), getValue(), getValuePointer(), and CEvaluationNodeObject::setObjectValuePtr(). Definition at line 332 of file CEvaluationNode.h. Referenced by CEvaluationNodeCall::calculate(), CEvaluationNodeOperator::calculate(), CEvaluationNodeLogical::calculate(), CEvaluationNodeLogical::CEvaluationNodeLogical(), CEvaluationNodeOperator::CEvaluationNodeOperator(), CEvaluationNodeCall::compile(), CEvaluationNodeObject::compile(), CEvaluationNodeDelay::compile(), copyNode(), CEvaluationNodeDelay::getBerkeleyMadonnaString(), CEvaluationNodeFunction::getBerkeleyMadonnaString(), CEvaluationNodeCall::getCalledTree(), CEvaluationNodeDelay::getCCodeString(), CEvaluationNodeCall::getCCodeString(), CEvaluationNodeFunction::getCCodeString(), CEvaluationNodeObject::getData(), CEvaluationNodeDelay::getDisplayString(), CEvaluationNodeCall::getDisplayString(), CEvaluationNodeFunction::getDisplayString(), CEvaluationNodeCall::getInfix(), CEvaluationNodeObject::getInfix(), CEvaluationNodeDelay::getInfix(), CEvaluationNodeFunction::getInfix(), CEvaluationNodeDelay::getMMLString(), CEvaluationNodeCall::getMMLString(), CEvaluationNodeOperator::getMMLString(), CEvaluationNodeFunction::getMMLString(), getType(), CEvaluationNodeDelay::getXPPString(), CEvaluationNodeFunction::getXPPString(), CEvaluationNodeConstant::isBoolean(), CEvaluationNodeFunction::isBoolean(), printRecursively(), CEvaluationNodeObject::setData(), CEvaluationNodeObject::setObjectValuePtr(), CEvaluationNodeOperator::simplifyNode(), and CEvaluationNodeFunction::simplifyNode(). Definition at line 337 of file CEvaluationNode.h. Referenced by CEvaluationNodeCall::calculate(), CEvaluationNodeChoice::calculate(), CEvaluationNodeOperator::calculate(), CEvaluationNodeVariable::calculate(), CEvaluationNodeLogical::calculate(), CEvaluationNodeFunction::calculate(), CEvaluationNode(), CEvaluationNodeConstant::CEvaluationNodeConstant(), CEvaluationNodeDelay::CEvaluationNodeDelay(), CEvaluationNodeNumber::CEvaluationNodeNumber(), CEvaluationNodeObject::compile(), CEvaluationNodeConstant::getBerkeleyMadonnaString(), CEvaluationNodeConstant::getXPPString(), and printRecursively().